Drawing on several years of study in Spain, guitarist Daniel Maya performs a subtle mixture of Flamenco, Brazilian and Afro-Cuban styles. He crafts a moving sound best described by his album title, Echoes of Paradise. 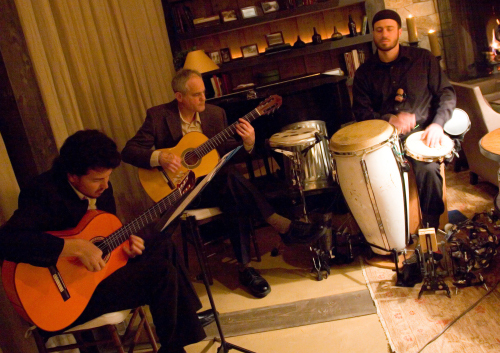 While in Spain, Daniel Maya studied Flamenco guitar with Pedro Bacan, Paco del Gastor, and David Serva, among others. In Sevilla, he lived and practiced with a family of gypsy Flamenco performers from the famous Amaya family of Moron de la Frontera. In the Bay Area, he has performed length engagements in San Francisco at the Four Seasons Clift Hotel, the Sheraton-Palace, and the El Greco Restaurant at the Cannery. He has also appeared at many wineries in Napa and Sonoma, including Robert Mondavi, Sterling, Joseph Phelps, Beringer, Clos Pegase, Viansa, and Billa Mt. Eden. His group also has been featured at the San Francisco Jazz Festival, San Francisco Performances, and the San Jose Jazz Festival.